Or, For shoes, put on the readiness to preach the Good News of peace with God. This is the third of 7 “scenes” depicting each of the pieces of the armour mentioned by the apostle Paul. Putting on the whole armour of God protects us in the battles of life & faith. I enjoyed drawing these sandals, but I needed a photograph for reference. These shoes appear to be made from only a few pieces of leather, yet they are very complicated & took a long time to draw & colour up! I decided early on in the design process to include a white cross on each piece of the armour, which is my way of signifying that this is not merely armour, but is spiritual, God-given armour, empowered by Jesus’ sacrifice on the cross. Notice the small white crosses in the heals of the sandals. 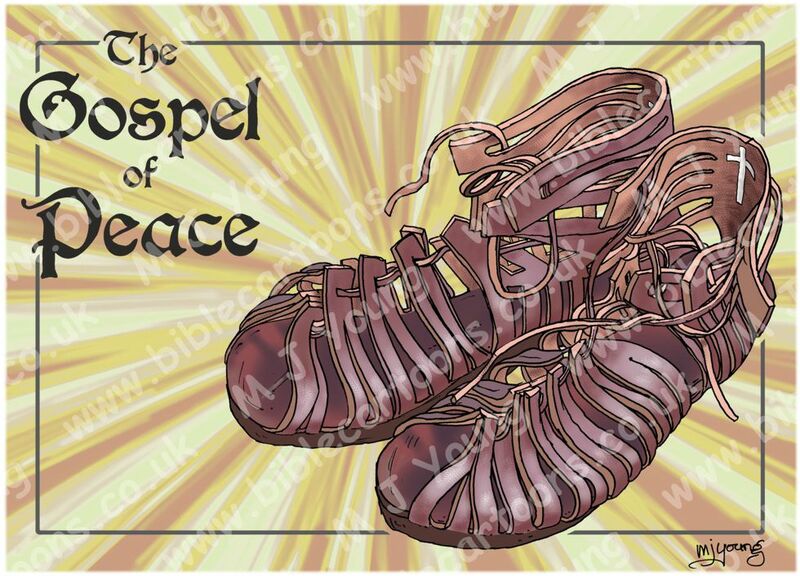 Shoes fitted with the Gospel of Peace: what is it & what’s it for? And having shod your feet in preparation [to face the enemy with the firm-footed stability, the promptness, and the readiness produced by the good news] of the Gospel of peace. From the above we get the sense that the Gospel of Peace helps to prepare us to stand; that it brings us sure-footedness & confidence in the spiritual battles & struggles to be able to stand; that it is our responsibility to learn the Gospel of Jesus, so that we are prepared, willing & able to stand our ground. 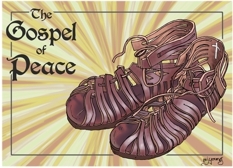 Application: why Shoes fitted with the Gospel of Peace? Thinking about our military metaphor once more, it would be no good at all if a soldier had the very best arms & armour in the world, but when it came to walk or run into battle, he or she fell over! Or worse still, was in the middle of a conflict, but couldn’t rely on their footwear to keep them upright & secure on the battlefield. In the same way, we must have our spiritual feet fitted with shoes that we are totally confident will keep us from slipping in any & all of our personal conflicts against the Devil. If our minds are thoroughly versed in the Bible (the Gospel of Peace) then we will be well equipped to stand our ground in the time of testing. As the quote from the Bible Background Commentary above points out, a soldier needs to concentrate their attention on the battlefield, the enemy he/she faces, the tactics employed, the weapons used, whilst keeping a strategic overview of the battlefield… it would be very difficult to do all that if the soldier where not sure of their own footwear, or were distracted by it! Conversely, a soldier who is unsure of their own footwear, or who concentrates overmuch on it, has their spiritual “eyes” on their feet, & can not have their “eyes” on their enemy, or the battle – which could be disastrous for them! That’s why it is SO important to make good, sound preparation BEFORE goi9ng into battle. There might be two difference situations we could consider in order to understand the importance of our spiritual footwear: 1) Standing our ground & 2) Advancing into battle. 1) Standing our ground refers to a Christian’s stability or surefootedness, which comes from knowing the Gospel. It is this Gospel knowledge & application to oneself which gives us peace & confidence in our hearts, so that we are able to stand in times of spiritual conflict & struggle. Reading the Bible; knowing the Gospel, is our preparation BEFORE we go into battle. Our preparation helps us to confidently stand our ground, & not to be distracted by anything else. Jesus used the Bible as his defence when he was tempted by Satan (see Matthew 4:1-11, Mark 1:12-13 & Luke 4:1-13) & was able to do so because he read & thoroughly knew the scriptures, being able to quote them in his own defence as the Devil tempted him. Since Jesus is our example in all things it should be obvious that we Christians need to become as familiar with the Gospel of Peace (the Holy Bible) for exactly the same reason: we too will be tempted by the Devil, & we too need to mount an effective defence when that temptation comes to us. Just as in Jesus’ own case, the Gospel of Peace is given for our protection as another vital piece of our spiritual armour. 2) Advancing into battle. As Christians we are to share our faith with those we come into contact with, which involves telling people the Gospel. By doing so we are helping to advance the Kingdom of God, by driving back the kingdom of darkness (or evil, the Devil’s kingdom.) It should be quite clear to every Christian that we are always in a spiritual battle, every day of our lives. We Christians can expect to come under attack from our enemy, the Devil, but the armour of God is given to protect us from these attacks. Every piece of the armour is vital, & together it provides a complete, seamless, encasing protection for us… but we must remember to put it on if we want that protection! Feet shod with the Gospel of Peace are vitally important, both as a preparation for the spiritual struggles we face every day, & in those special cases where we are actively advancing the Kingdom of God. When the enemy, (Satan, the deceiver (see Revelation 12:9)), offers us erroneous or false ways to peace, or else tries to get our mind’s attention to focus on our concerns &/or fears, Christian’s can stand up to him, by quoting from the Bible, which is a way of reminding ourselves, & our spiritual adversaries what the truth really is: we are free to pursue our special relationship with our loving heavenly Father, through Jesus our Lord, by the mighty power of the Holy Spirit. Paul reminds us in Romans 8:37-39  that nothing in all creation (especially including the Devil) can stand in the way. 37 Yet amid all these things we are more than conquerors and gain a surpassing victory through Him Who loved us. 38 For I am persuaded beyond doubt (am sure) that neither death nor life, nor angels nor principalities, nor things impending and threatening nor things to come, nor powers, 39 Nor height nor depth, nor anything else in all creation will be able to separate us from the love of God which is in Christ Jesus our Lord.